Continuing with the weather theme (after a long absence--sorry about that) . . . If there's one thing I've always hated about rain, it's that it's so darn boring. The combination of grey skies, ruined hair, and wet socks can make me want to crawl under a rock until the sun comes out. Fortunately, technology (Japanese technology, of course) has come up with an amazing solution. The Pileus Internet Umbrella was designed to make rainy days bearable. 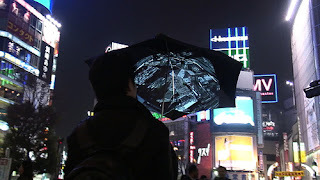 Inside the umbrella you'll find a large screen that can display images from the Internet. You have the option of watching photo streams from Flickr or switching to Google Earth and viewing a 3-D image of your surroundings. There's even a camera inside the umbrella so you can take pictures of all the miserable people slogging through puddles and upload them to the Internet! i love the rain espaicaly when it rains at night and you can go out and dance while no ones watching :) the umbrella looks fun! Theatre: I love doing that too! i was born while it was raining, RAIN ROCKS!!! currently (well, more like last week) it rained so much the creek across from my hous flooded, not over the banks, but a good four feet or so. Aguy even canoed down it one day!